A delicious lunch and a cold beer at Bridges. Summer at its best! One of my favourite places to spend a lazy Sunday afternoon with family and friends is on the patio at Bridges. The waterfront view from the 300-seat patio is stunning. For more than 30 years, Bridges has been a landmark on Vancouver’s waterfront. Located next to the Public Market, Bridges dockside patio is a great spot for people watching and is renown for its magnificent views of the downtown skyline, marina and mountains. The patio is also an ideal place to relax and watch the sunset. While the prices may be steep, don’t forget you are also paying for the impressive view. My favourite lunch at Bridges is their delicious halibut and crab cake burger with chili lime mayo, shredded lettuce, tomato, red onions, and caesar salad. Try one Granville Island’s lagers with your meal. You won’t be disappointed. The dockside patio is open from the last Friday in April until the last Sunday in September. The Bistro & Bar is open Monday to Saturday from 11:00 AM and Sunday from 10:00 AM. The Top Floor Dining Room is open for dinner Tuesday to Saturday at 5:30 PM. Reservations are recommended. 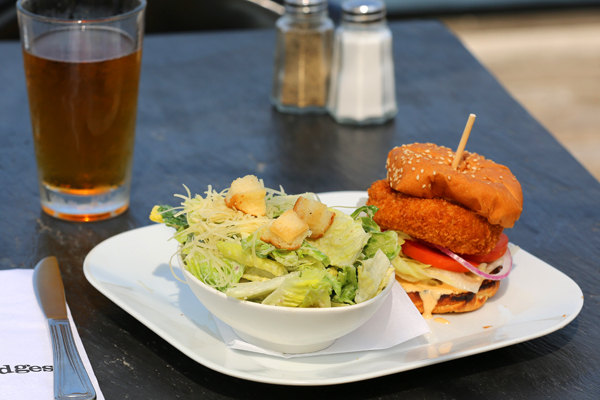 On your next visit to Vancouver, drop by Bridges and enjoy lunch or dinner dockside. It is Annie. Granville Island is a great place to spend the day.